Last week, I decided that I was going to join the Meatless Monday movement. 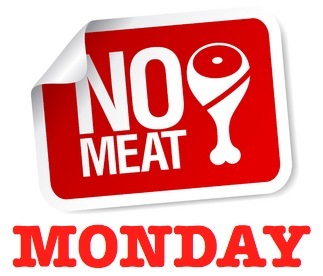 I have to admit, I thought it was a funny concept the first time I heard of it; No Meat on Monday?!? It just seemed like a fad, like planking or silly bands. I already have an interesting relationship with meat; I don’t think I need anything to make it more complicated. See, I was actually raised a vegetarian. I think I was 8, the first time I tasted red meat. My Mom and I moved in with my Grandma. She wasn’t a vegetarian but we were. My Mom would cook 2 meals, one for Grandma with meat and something without for us. When my Mom wasn’t looking, Grandma would sneak me pieces of meat. I think my Grandma equated vegetarianism with being a hippie and thought that meat would keep me grounded, ensure I would go out into the world and get a real job when I grew up. I was like an animal getting the taste of blood for the first time; I was hooked. Now let me clarify things a bit. By hooked I mean that I love a great burger, enjoy a few strips of bacon at the breakfast buffet, and lamb chops are my favorite, but this is where the “interesting relationship” part comes in, I also love stuff like tofu and falafel. When I go someplace and order falafel I don’t do it because I’m making some stand against meat, I do it because I enjoy falafel. So back to this whole Meatless Monday thing. I read this article on Civil Eats: Eating Less, Better Meat: Yes, We Can. The first paragraph intrigued me. Not because the writer gave me a whole bunch of facts and statistics, but because she has her own “interesting relationship” with meat; she’s a vegetarian, while her husband and kids aren’t. I decided this was someone I could trust, who wouldn’t judge me because I ate meat. She had a couple of links in her article, one of which was to the Environmental Working Group’s Meat Eater’s Guide. There’s a tab that said, Take the Quiz. I love any opportunity to show how smart I am, so I decided to take the quiz. I’ll admit that I failed it. When I got the chance to look at the answers, I was shocked. I had definitely underestimated the impact our modern meat industry has on our environment. One of the questions, #10: Over the 10 years from 2000 to 2010, how much taxpayer money was used to support crops to produce animal feed (e.g., soy and corn)? A) $600 million, B) $16 billion C) $45 billion. I went with B. I was wrong. The answer was C, $45 billion. That’s A LOT of money. Question #13 stumped me too. What percent of meat raised in the U.S. (for domestic consumption) is produced in confined-animal feeding operations (CAFOs)? I was alarmed that the answer was over 90%. I had no idea it was that much. And then there was questions #8: When a family of four gives up one burger and one steak each week for a year, it’s like taking their car off the road for? The answer is 4 months (I actually got this one correct). I was starting to realize the impact that Meatless Monday could have. So I decided I would go for it. Last week I partook in my first Meatless Monday. Well, I actually had to do a re-do, I didn’t read the article until after lunch on Monday so it was Meatless Tuesday. I’m very fortunate that not only do I work someplace that provides lunch everyday, but they also take into consideration vegetarian eating habits, so lunch was no problem. For dinner I was a little nervous since I needed to go grocery shopping and would probably have to pick something up. I wasn’t getting off work until late, so I knew my options would be slim. Then Chipotle popped into my head. I ordered a vegetarian burrito. The veggies were grilled al dente, so they were crisp and had a great grilled flavor. And whether my burrito has meat or not, I can’t get enough of Chipotle’s cilantro lime rice. Beans, a key ingredient in burritos, are also a great source of protein. My first Meatless Monday has inspired me. Not only will I continue, but after talking with my Mom, she decided she would give it a try too. So look forward to more posts on Meatless Monday. I plan to post some recipes as well as Meatless Monday friendly eating options both on and off the strip. One thing, I always hear from my vegetarian and vegan friends, is how hard it is for them to eat on the road. To find out more about Meatless Monday’s visit the website. There are tons of resources including recipes, articles, even t-shirts. Also, check out EatWild. It’s a great site with links to farms throughout the US and Canada that offer grass fed and pasture raised animals. This entry was posted in Meatless Monday and tagged Chipotle, Meatless Monday, vegan, vegetarian by greedygirlinlv. Bookmark the permalink. listen to my song “No Meat On Monday” by a click at the my website above. Cool song! Good luck with the contest!